Flapjacks are marvellous things. They’re quick to make, tasty and not quite as naughty as most sweet bakes. 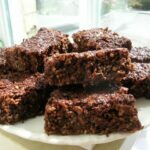 These rich chocolate coconut flapjacks are made additionally tasty and chewy by adding desiccated coconut and raisins. This is a super speedy recipe for when you want something scrumptious in a hurry. I’ve seen various recipes for chocolate flapjacks over the years and to be honest I couldn’t really see the point. Flapjacks are so good anyway, how could they get better? Well, I’ve tried it now and I have to say they were good, not necessarily better but certainly different with a rich chocolatey flavour. As it turns out, this recipe for chocolate coconut flapjacks is the one out of all my flapjack recipes that my friends request the most. You’re most popular recipes are my carrot cake flapjacks and raspberry & white chocolate flapjacks. My basic flapjack recipe is adapted from the one in one of my favourite vegetarian cookbooks, Gaia’s Kitchen by Julia Ponsonby. Pretty much all you need to do is melt the butter, sugar and golden syrup in a large pan. Then it’s just a case of adding the remaining ingredients, stirring, scraping into a tine and baking. I usually use a few more oats or less syrup than the original recipe to make it less sweet and always end up adding various bits to it. This time I added chocolate, coconut and raisins. Thanks for visiting Tin and Thyme. 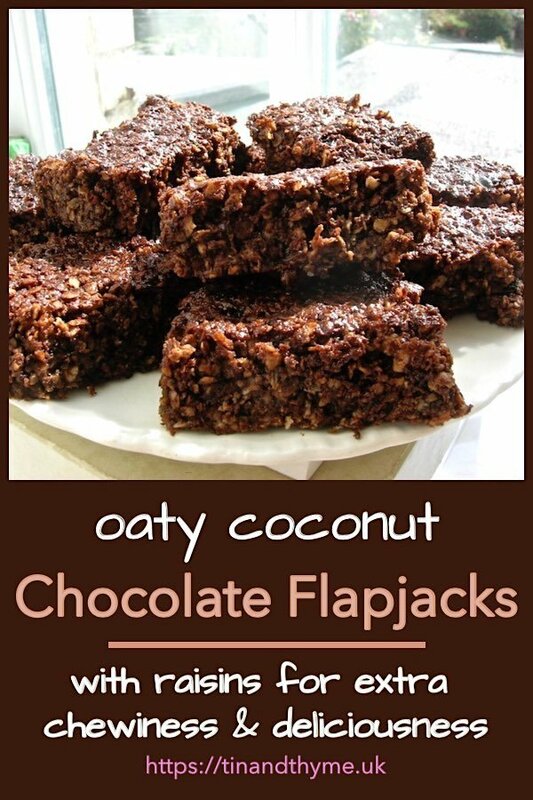 If you make these rich chocolate coconut flapjacks, I’d love to hear about it in the comments below or via social media. Do share photos on your preferred social media site and use the hashtag #tinandthyme, so I can spot them. For more delicious and nutritious recipes, follow me on Twitter, Facebook, Instagram or Pinterest. Chocolate Coconut Flapjacks. PIN IT. 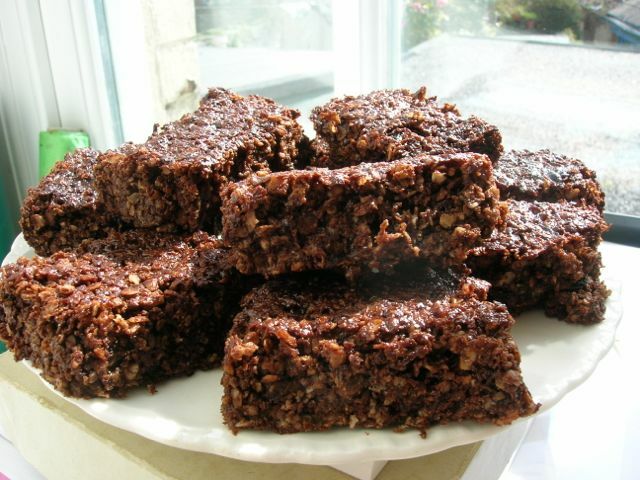 Rich chocolate flapjacks which are made additionally tasty and chewy by adding desiccated coconut and raisins. This is a super speedy recipe for when you want something scrumptious in a hurry. 2 oz (55g) of raisins. Melt the butter with the golden syrup, muscovado sugar and chocolate in a large pan. Stir in the salt followed by the raisins, coconut and oats in that order. Using the back of a spoon, press mixture into an 20cm (8″) sq greased cake tin and bake at 180℃ (350℉, Gas 4) for 20 mins. Or until the flapjacks are golden, but not too dark. Leave to cool in the pan then cut into 12 pieces. Exact baking times will always depend on the oven you use. Haha Henk, I don’t think there was even one comment on this one before yours. It was only a month after I started my blog and no-one had discovered me at this point. I’m very glad to have a comment now – finally, so a big THANK YOU. I made these for friends once and they were so enamoured they make them all the time now. I’ve just been sent some commercial flapjacks for review and I have to be honest they bear not a patch on a homemade one. Choclette, I suggest to rename and reblog these for all your new followers then. Made them again yesterday. They are just só good. I have sticked to the cranberries because they go so well with chocolate and are a bit more special than raisins. I added a larger pinch of seasalt this time and it worked well. To keep a good texture I store them in the fridge. With the warm weather we are having right now they tend to crumble easily. When cool, the texture is most pleasant. Really pleased you’ve taken to flapjacks in such a big way Henk. Maybe they will now catch on in Holland? Cranberries do sound good. I’ve been wanting to make these again for ages and when I do, I’ll be sure to use cranberries. Hi Choclette, I now know what happens when one forgets to add the sugar: they are too crumbly to cut, but are still very tasty. I guess they make a good ‘ingredient’ for a dessert; with icecream, in a trifle, etc. To make up for this mistake and to reassure myself I made a new batch straight away and substituted half of the coconut for finely chopped mixed nuts. The flapjacks turned out fine, as usual. Just had a big slice for tea. Ah, glad to hear it’s not just me that forgets key ingredients Henk and I’m glad the second batch came out alright. It’s great to have you remind me of these older recipes. I know this one was quite popular with friends who now make them regularly. Forgot to mention in my previous comment: in the second batch I forgot the salt (no big thing, but it does well in this recipe) and added 25 g of Kirsch. A simple variation, but with a good effect. Still making these. My mum loves them, and they are so quick and easy to make. Yesterday I tried to make them a little less crumbly by adding 25 g of course polenta flour and 50 g of milk. Just so you know: it didn’t make any difference at all :)) No problem, they still taste great ! I’ve got friends who never make any flapjacks but these now. I haven’t made them for a long time, but I don’t remember them being overly crumbly – flapjacks are meant to be a little bit crumbly! I’ve been meaning to try them again for ages though – it’s a constant cry, but if only I had more time!